Now that I am back home from a remarkable three day workshop with Ruth Armitage, I am processing what I can apply to my own painting process from a cornucopia of ideas and tools Ruth generously shared. I cannot begin to make a complete review of the workshop because her quotable pearls of painting wisdom were numerous. The atmosphere so friendly in an ideal size class of 8. Two well mannered dogs, jokingly referred to as the therapy dogs, were one comfort we experienced in Ruth's attic studio in the Oregon City countryside. Here creative permissiveness encouraged fearless exploration. I came to the workshop being dissatisfied with many of my abstracts. I have been oscillating between impressionistic work to almost unrecognizable subjects as far back as I can remember as a child growing up in the San Francisco Bay Area where I was exposed to a local artist working in a cubist style. Recently I have retired from selling my work and concentrating on keeping a limited body of stronger work from all of my periods. In a limited space, I retire mostly my abstract pieces because they are not as interesting to me. Ruth on the second day demonstrated her process to color dominate painting. She dressed in interesting complementary colors and she said she pretends she can not fail. She choose nine titles from a list of titles she keeps on her phone. Then she did some small compositional sketches in color for each title. She felt free to attempt the unexpected without being judgmental. Why not express smoke with yellow green? The unexpected is powerful. Perhaps if I made lists of painting titles around a personal subject, my abstract paintings would develop narrative making my connection to them greater resulting in my caring about them even after many years. On the other hand I might be less intuitive. Also my first markings on a painting are the freshest and I could loose that energy by moving from a thumbnail to a larger finished piece. So what it boils down to is starting out on the paintings without preliminary preparation means only a few develop the involvement that stands the test of time. 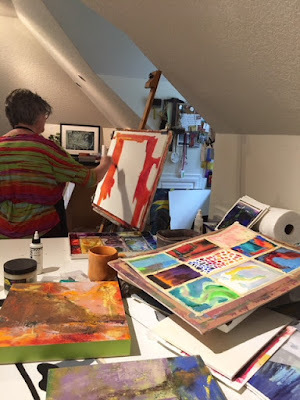 Looking at my favored abstracts they are all connected to a time where I had a heightened emotional occurrence. I like them not just because of a sentimental remembrance but I performed better at the creation of the piece from whatever I was experiencing at the time. I do not have failed abstracts just unfinished pieces and more frustration than I want in the future or need to create for myself. I shall try a modification of her method for a short time and see what happens. Back to Ruth's demonstration : For her finished demonstration piece she chose from the nine spontaneous renderings she did of her titles. While painting her piece, she focused on the subject helping her to keep her Judge away so she could continue feeling free to play. Only later if the painting isn't working does she refer to applying her list of principles of design. Another trick to prevent tighten up is to talk to her Judge. She says," Inner Judge, I don't want to hear you say this is crap because you interfere with the fun, spontaneity, and creative surprise." Then if that doesn't work she says " So you are still here judge, time for me to take a break." Before the workshop sometimes when a painting was not going well I felt frustrated thinking the painting was getting crappy, I didn't take breaks.I would become frenzied trying to prove to me that my Judge was wrong and my whole feeling of self worth depended on being able to prove that I could paint. Regrettable results usually developed! It is also not always enough to stop one piece and start another. I need to become more self aware of when I am responding to the counter-productive Judge. Talking to my Judge would mean I recognize the Judge and automatically I hope I will reset my thinking and mood. Ruth gave additional tools to arm me against the detrimental Judge in my mind but I will not go into them here. I think I have made the point on how I am processing and I am eager to get back to painting. When Ruth came around to help us, if we needed it, I mentioned that only a few of my abstracts that are far from representational survive the test of time. I would have more success if I follow your process. To which she responded with doubt. I believe I am not a narrative painter and years ago more intuitive than now. Part of me says I should continue to trust reacting to the canvas activated by a few random marks. Yet the promising thing about Ruth's process is that refusing to listen to your inner Judge does open the door to intuitive choices. Ruth said she is not intuitive but I disagree. She is an intuitive painter balanced by moderation. She only refers to the academic elements of design when the painting doesn't seem right. The third day Ruth did a demonstration focusing on line. Dressing for success, Ruth wore an outfit with subdued black and white Which drew my first impression to the variety of linear patterns in her clothing. Before Ruth's workshop I disliked pulling myself away from painting to shop for clothes. I wanted to spend money on art supplies rather then clothes. Now I hope I will enjoy clothes shopping more when I search for clothes that will express the kind of paintings I want to make. I once commissioned a felted scarf by Patricia Berman who fashioned it in response to one of my playful collages. Now I have a reason to allow myself such a luxury in the future. Before the workshop I had a dim view of sitting while painting. But after seeing the results of the other students, I want to try sitting for smaller brush movements where edges of shapes are expressive and standing while painting bigger movements. The closest thing to journaling is Ruth's lists of subjects, but I was reminded of 20 years ago at a WSO meeting where Donna Watson, and Ruth talked about the importance of journaling in their painting metamorphose.So I will journal and make lists. Some will be subjects I would be happy to share.can share. If there is interest a future blog could be my journal on how inspired I am by the students comments and the work they did. Of course I will share my work during and after the workshop next Wednesday. Thanks for the great workshop review, Diane! I hope you’ll find that some of my tips encourage you to power through the tough painting spots. I enjoyed watching your process! Thank you. I'll be working a little each day. So I cannot fail to power through.